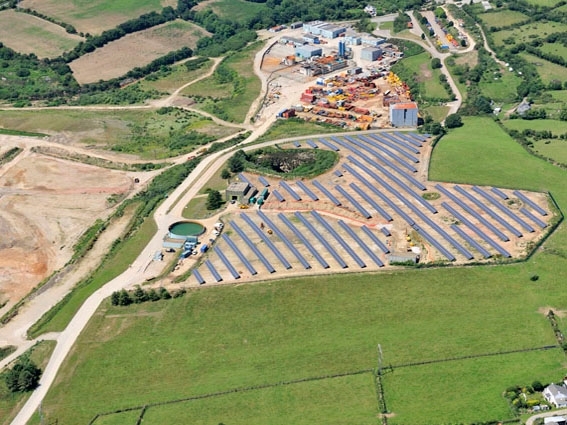 The South West’s first solar farm has been connected to the grid in Cornwall by UK-based solar developer Lightsource Renewable Energy. On the site of a disused tin mine, the 1.4 MW farm is the biggest in the UK to date. Covering a 7.2acre plot at Wheal Jane, Truro, it is the first of many renewable energy projects planned at the reclaimed mine. The farm’s 5,680 solar panels will generate 1,437 MWh of electricity a year, enough to power the equivalent of 430 homes in the area and save over 737 tonnes of CO2 emissions a year. Lightsource Renewable Energy has a number of additional sites being built across the UK, due to be connected by the end of the month. Lightsource Renewable Energy Ltd. worked with Solarcentury, the UK’s most experienced solar energy company, to deliver the solar farm; the project is funded by Octopus Investments. For the construction of Wheal Jane solar farm, local contractors were employed to carry out the work, preparing the land, supplying fencing and installing the solar panels. The solar farm is situated at Wheal Jane, a reclaimed mine site, due to be home to the UK’s first earth science park that will use renewable energy from solar, wind, hydro, shallow and deep geothermal sources. The site is currently being developed with plans underway for a 60,000sqft business park. Truro and St Austell based law firm Stephens Scown LLP has provided property and commercial legal advice to the Wheal Jane Group throughout this project.